Coaching Styles – Is there a correlation between coaches leadership and injury rates? Have you ever wondered if your coaching style could affect your teams injury rates and the availability of players on your team? Recent research suggests that certain types of leadership can have a negative impact on players health and well-being. When trying to get a performance edge it’s important to cover all the bases. And so alternative risk factors can be investigated to determine injury risk factors. Leaders influence others with a view to achieving a common goal and facilitating circumstances to help reach the goal. Leaders motivate and inspire their followers to go beyond their self-interest for the benefit of the collective interests. Transactional leadership is based on rewarding, motivating, directing and punishing followers on their achievements and failures. Leadership has nothing to do with your position in the heiracy of a team. Leadership doesn’t automatically come with a title. Although hopefully when you get to a senior position, you will have developed the skills. Leadership has nothing to do with your title. You don’t need to have the title of ‘coach’ to be a leader. Being a player doesn’t mean you can’t also be a leader. Your personality has nothing to do with leadership. When you think of a leader you might automatically think of a stern yet charismatic person. However you don’t need to be an extrovert to be a leader. Leadership isn’t management. Managers plan, monitor, coordinate, hire and fire. Managers manage things, leaders lead people. Staff development is important to avoid severe injuries and to increase attendance at training – the study reported that leadership styles which treated staff as individuals and encouraged their development increased attendance at training by 4% and decreased incidence of severe injuries on the team by 33%. This could be due to a reduction of stress on both players and staff. Psycho-social stressors have been shown to increase the risk of injury. It is believed that this is due to increased muscle tension and reducing motor coordination. Holding a positive vision of the future reduces the risk of severe injuries – leadership types that communicated a clear and positive vision of the future were found to reduce the risk of severe injuries. Identifying new opportunities for the team and providing guidance may increase players expectations and intrinsic motivation to result in increased effort. Coaching charisma has no impact on injury rates or availability – it is often believed that charismatic leadership is a good measure of the effectiveness of a leader. However the study by Ekstrand et al. (2017) found no correlation between the charisma of a coach and injury rates or the players availability for training. It is suggested that coaches should build an interpersonal environment of support, respect, trust and appreciation for staff and players. Lead by example – the study found that a lack of clarity of the coaches values was linked to a 5% decline in players availability for training and matches. As a coach you are a role model which your players use as a source of guidance! Your discipline, training and diet should match that of what you ask your players. Innovative thinking could increase player numbers at training – a leadership style that encourages individuals to think about problems in new ways, and to question assumptions has been linked to increase attendance at training. Coaches who did this within the study encouraged players to challenge thinking and patterns of behaviour in search for improvement and excellence. These coaches were willing to take risks to achieve their goals and accept mistakes as an opportunity to learn. Supportive leadership has a positive impact – it was found that coaches who demonstrated supportive behaviour saw a team collective efficiency. 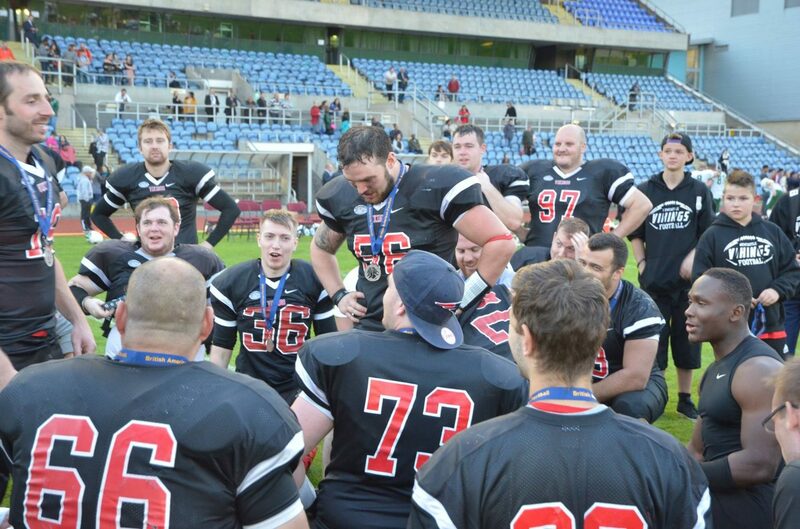 A supportive environment is not only important for the individual player, but for the whole team. As a coach it is your responsibility to look after your players. It is your duty of care to help reduce incidences of injury (where possible), whilst holding that ultimate aim of standing on the podium at the end of the season. Although it’s not something you will put on your risk assessment form, be mindful of your leadership style to enhance both individual and team performance. And remember as a coach you should be stoking the flames of passion for the game! Why not try to put these steps into action at your next training session?! Need a tool to provide feedback to your players to improve performance and track progress? Download your free coaches report card here! Ekstrand, J., Lundqvist, D., Lagerbäck, L., Vouillamoz, M., Papadimitiou, N. and Karlsson, J., 2017. 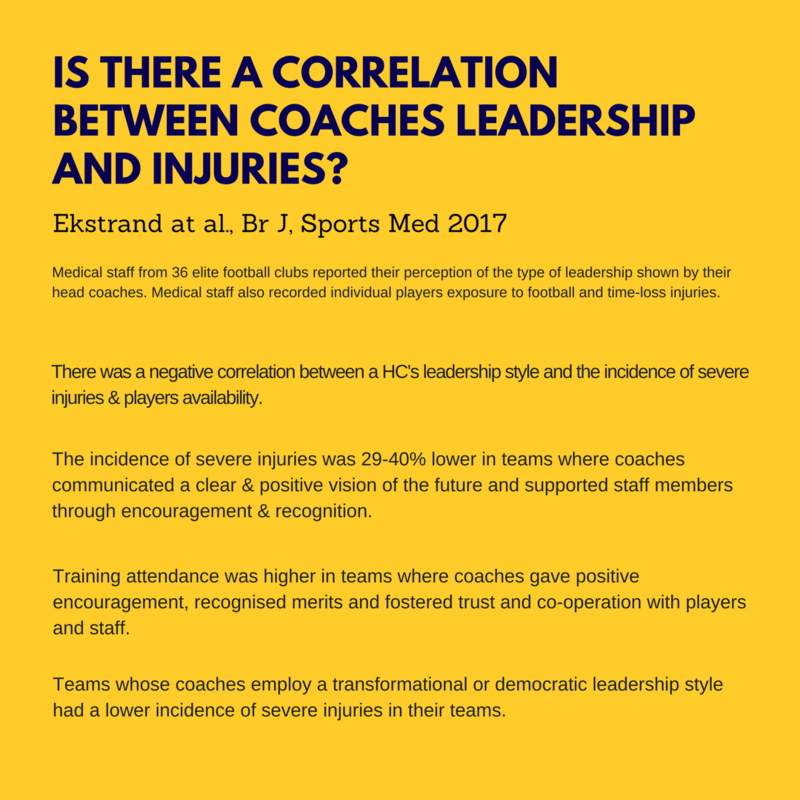 Is there a correlation between coaches’ leadership styles and injuries in elite football teams? A study of 36 elite teams in 17 countries. Br J Sports Med, pp.bjsports-2017. Williams, J.M. and Andersen, M.B., 1998. Psychosocial antecedents of sport injury: Review and critique of the stress and injury model’. Journal of applied sport psychology, 10(1), pp.5-25.